Yesterday this world lost a great man, Bob Warren, but let there be no doubt, he left this life and walked into Paradise to spend eternity. I was not fortunate enough to have known Bob Warren as well as others may have. I never attended a camp at The Hill. I was never fortunate enough to sit and study the Bible with him. I was blessed, however, with multiple opportunities to talk with him about many things as we stood on the sidelines of a football practice or a football game. Bob, and his wife Kim, chose to homeschool their son, Ben, just as Charity and I have homeschooled our boys. Charity met Kim a number of times through the years at homeschool events, and always felt she had the sweetest spirit about her. We only met Bob sometime later when their son, Ben, wanted to play football. Football is a tough sport for homeschoolers. It is expensive, requires a lot of practice, and it requires a lot of boys. Even so, Bob didn’t let that discourage him. He helped Ben pursue that dream, and through a lot of hard work and coordination, The West Kentucky Warriors were formed. Despite being a professional basketball player earlier in his life, Bob didn’t overexert his presence at the practices or the games, but he made sure that the team always had a spiritual focus, giving the glory to God for everything. I not only saw that though, I saw a terrific dad supporting his son in pursuit of a dream. 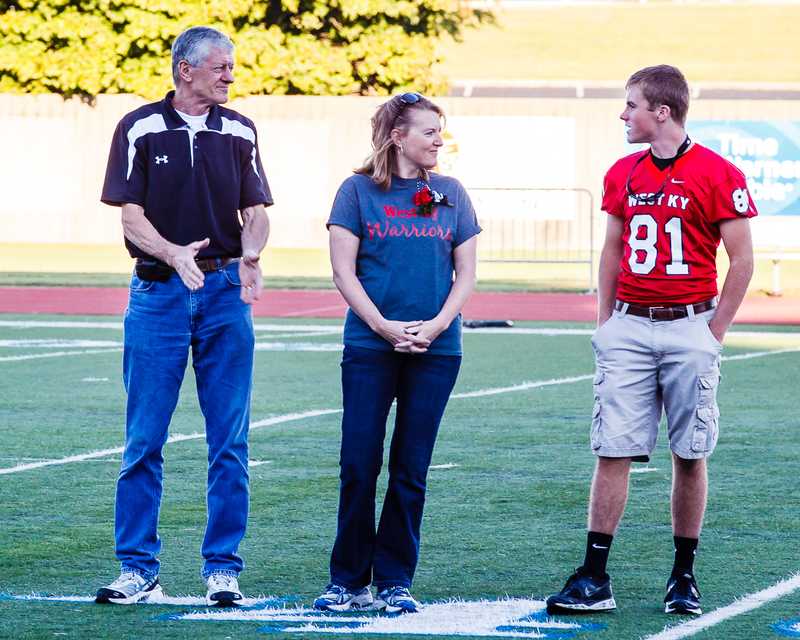 Last year Ben graduated high school, and perhaps one of the last pictures I have that Bob was included in was the picture of Bob, Kim, and Ben being honored on the field during the last game. Bob, Kim, and Ben Warren at Ben’s last football game. I will never forget Bob Warren, and I know that I am only one of many, many others who believe the same. He has left behind a legacy that is powerful, a legacy that was centered on Christ, family, and loving others. I am truly better off for being privileged to know him. This entry was posted in Pictures, Spiritual and tagged in Bob Warren, Christ, legacy, The Hill, tribute, West Kentucky Warriors.